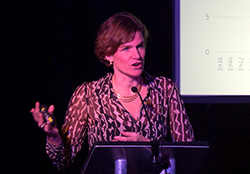 The New Statesman SPERI prize Lecture with Mariana Mazzucato of the Science Policy Research Unit (SPRU) at the University of Sussex took place last night at the Emmanuel Centre in London. Tony Payne, Professor of Political Economy and co-director of SPERI introduced this new prize for Political Economy. In his introduction Tony stressed that by political economy he was referring to the close interaction of economic and political processes in society which was the focus of a whole range of founding social scientists such as Adam Smith, Karl Marx and Max Weber. He added that gradually economics and political science broke away from political economy and despite the long history, ‘political economists today feel sometimes like they are riding up the down escalator.’ This sense that political economy needed to be more visibly celebrated led SPERI to think up the idea of establishing a new prize in the field of Political Economy in collaboration with the New Statesman. 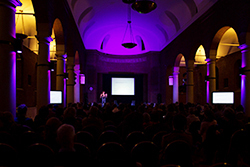 Despite the difficulty of choosing from among a very strong short list, the jury was unanimous in choosing the prize winner. 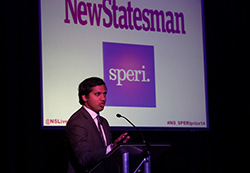 Faisal Islam, former Economics Editor of Channel 4 news, now Political Editor of Sky news, introduced Mariana Mazzucato of the Science Policy Research Unit (SPRU) at the University of Sussex and her thesis on the changing role of the state in a modern economy. Faisal said that there is a culture in the UK where you either think wealth creation is down to the role of the state or down to free markets – in reality though the world works in much more mixed economy. Faisal praised Mariana’s book for reflecting this in an enlightening and practical way. Marianna Mazzucato brilliantly summarised the key points of her winning work in an engaging and challenging talk that discusses the imbalances in the public and private risks and rewards from innovation, the roles that both sides should play and the implications for redistribution and engendering inclusive growth in the UK, Europe and the US. You can listen to Mariana Mazzucato in the audio below (7 minutes in). Photos of the lecture on facebook.